This present painting is related to Carl Schuch’s Still life with apples, a wine glass and a pewter jug, c.1876, in the collection of the Neue Pinakothek, Munich. It uses exactly the same configuration of the tablecloth and (especially) of the napkin tossed over the edge of the table in the immediate foreground: the folds of the latter are identical in both paintings, only differing in the more bravura, painterly style of the original and the more carefully worked quality of this painting. The pewter dish is the same in both pictures; so is the distribution of the fruits and the position of the pewter tankard. 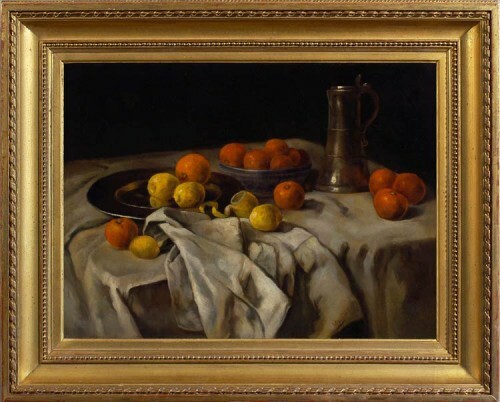 The oranges and lemons which replace the apples in the original work have the same intensely saturated and glowing colour; this, and the fact that this is an adapted composition, rather than a faithful copy, make it more likely that it was executed under Schuch’s eye. It is possible that the present work was painted by a student, relative or model of Schuch. A student might very well have been set as an exercise a variation on one of his master’s works, and might have signed it as a joke. A relative might have executed the same composition, and signed it with his/ her own name, again as a playful gesture. The signature differs markedly from Schuch’s own, and is placed much more obviously on a pale fold of the napkin towards the centre of the work, rather than emerging from the shadow in the far right-hand corner, as in the Munich painting. Carl Schuch was on born in 1846 into a wealthy Viennese family. He was taught art for three years in his home city by Louis Halauska, after which he traveled to Italy with the painter Albert Lang. On his return, he established a studio in Munich where he met and befriended Wilhelm Trübner, Wilhelm Leibl and Hans Thoma (the ‘Leibl circle’). Trübner, Leibl and Schuch painted each other’s portraits, shared their models and discussed art exhaustively. Schuch lived in Italy from 1872-73, amongst the large community of German and Austrian artists, who congregated particularly around Olevano; Schuch saved a grove of oak trees near Olevano, arranging for its purchase by the German state. In 1873 he met the artist Karl Hagemeister, developing a lifelong friendship with the man who later became his biographer, painting landscapes with him in the neighbourhood of Salzburg and in Germany. He also traveled to Holland and Belgium, and from 1876-82 lived and worked almost exclusively in Venice. Whilst there he produced mainly still life paintings, developing his own realist and painterly style. From 1882 he worke din Paris, where he was influenced by the work of Corot, Courbet, Manet and Monet. Schuch married a Frenchwoman, and returned to Vienna, where he died at the age of 57.